UPS: Expected delivery time: only 2 business days. EMS: The company undertakes to deliver by 3 business days. Sometimes it takes them over 2 weeks. 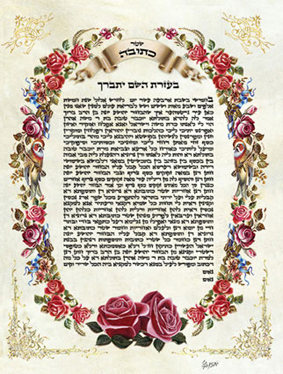 You are now at the peak of your wedding preparations, and have reached the phase of selecting a Ketubah! 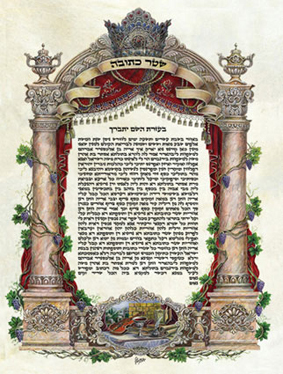 The Ketubah is the most important thing of the Jewish wedding. 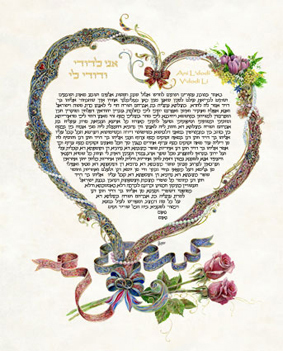 Apart from its design and visual beauty you have the significant elements for the Jewish law to ensure for a successful marriage. 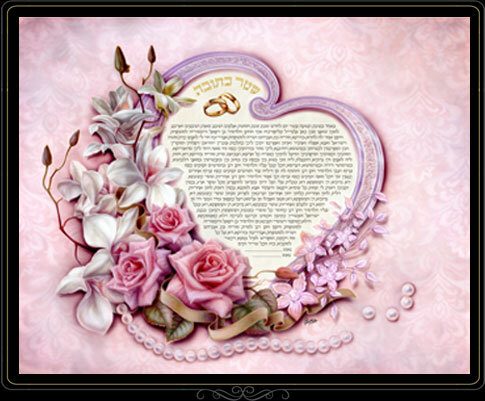 We are here to accompany you through this process and we guarantee to satisfy you with our quality and service. 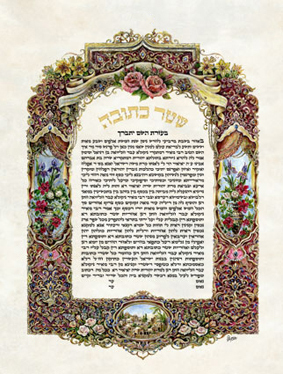 Here we present you with a vast selection of Ketubahs which can be purchased, in different styles and with a variety of options to upgrade and customize your print to the level of an original, within your budget. 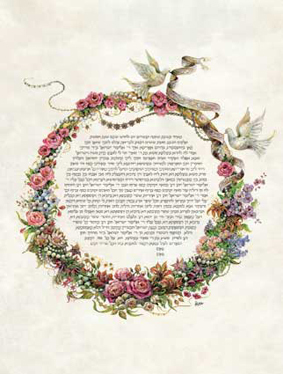 Scroll down and select your favourite print. 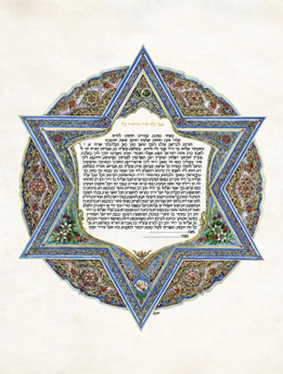 The Ketubahs are printed with a specialized printer, used in great museums around the world, designed for the printing of Lithographs and Giclee of high quality. 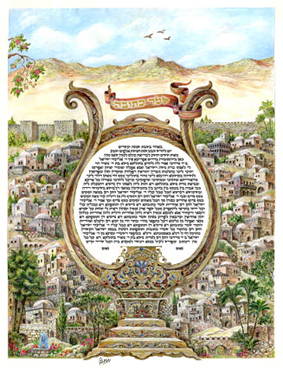 The colours and quality of the printing are impressive and compare to that of an original. 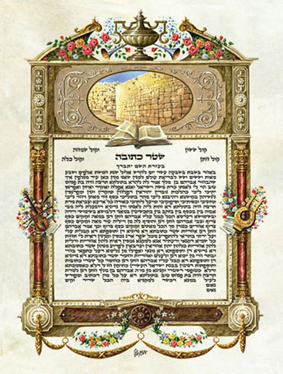 The paper onto which we print the Ketubahs is the world’s best quality paper produced by the company Teeco. 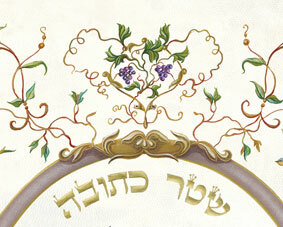 a. Painting an additional layer of acrylic paints and gold by our professional artists. 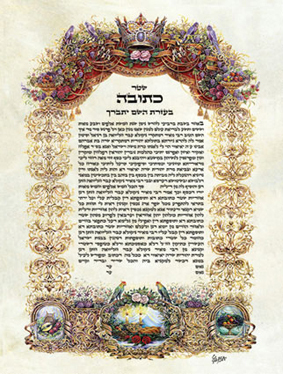 This accentuates the colours and upgrades the Ketubah to the same level as an “original”. 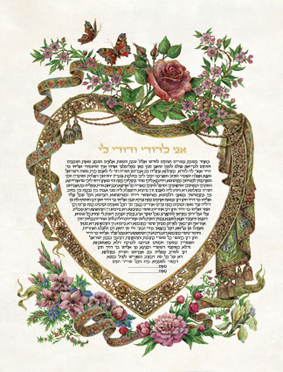 b. Tracing the text over with ink by a Sofer Sta”m (scribe of Sifrei Torah, Tefillin and Mezuzot). 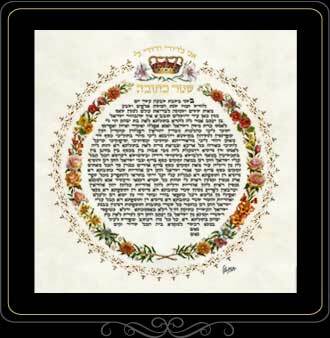 This ink overlay accentuates the letters and causes them to shine, it also protects the writing. 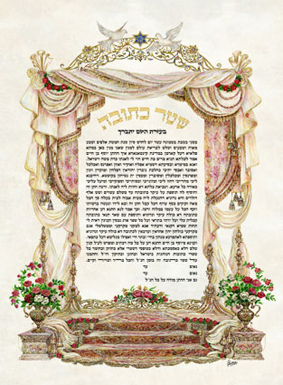 c. Adding 23K gold over the title ‘שטר כתובה ‘ or any other words you choose. 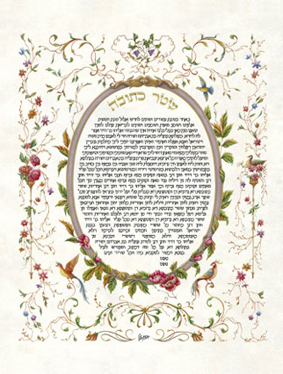 d. Meticulous, delicate sewing of velvet onto the Ketubah beneath the parchment, which protects the parchment from cuts, enhances its appearance and gives it a finished look. e. Filling out the information of Bride and Groom (free of charge). 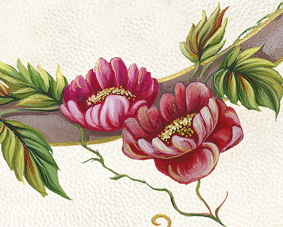 a. Painting an additional layer of gold acrylic paint by our professional artists. b. 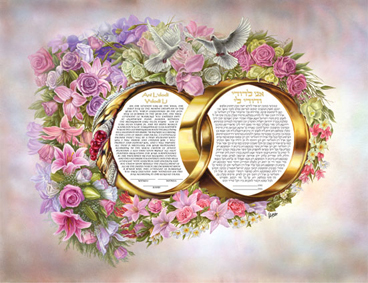 Adding 23K gold (Gold Leaf Ketubah) over the title ‘שטר כתובה ‘ or any other words you choose. c. Filling out the information of Bride and Groom (free of charge). 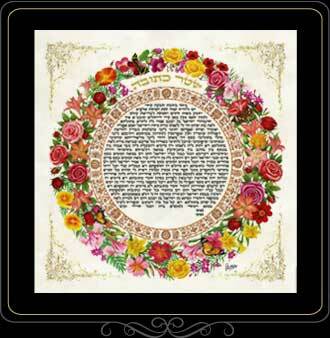 It is recommended to have your artwork framed and hung on your wall after the wedding. The prices for the various upgrades you will find in detail on the order form.